THE ADDRESS Magazine is a leading publication that presents luxury homes for sale and luxury lifestyles across the world. The ultra-stylish publication boasts an oversized “Coffee Table Magazine” format, and is filled with high quality editorial, beautiful photographs and timeless content. This premium magazine caters to those with sophisticated taste for excellence in a coffee-table display-worthy magazine – one that you will read from cover to cover and pour over again and again. Here are 728 glossy pages of luxury served with an edge. Browse THE ADDRESS Magazine and discover an exceptional range of international real estate for sale in the most desirable areas of the world, from luxury city centre penthouses to magnificent country estates, and from spectacular coastal properties to historic castles. This is also where we bring you the true style of inspirational living from food and travel to beauty and well-being. Do not miss our stunning historical country residence in Andalusia for sale, which is an estate of exceptional beauty, refinement and privacy. Impeccable design, rich character and magnificent detail grace the residence. With its mansion-like proportions, endless elegance and impressive surroundings, the home redefines luxury living in South of Spain. This extraordinary hacienda for sale near Seville is a truly spectacular residence, a trophy property. Exceptional in every way, our showstopping contemporary ocean villa for sale in Praia da Luz, Lagos, Algarve takes sophisticated architecture to new heights. Flawlessly designed with uncompromising attention to detail, it is both visually striking and immensely stylish yet functional. With its enviable waterfront setting, the exceptional villa captures breathtaking panoramas across the sparkling ocean towards the horizon. When it comes to envisaging a stylish and elegant lifestyle one of the most evocative concepts is that of a beautiful family home on the French Riviera. It does not come better than our luxury Belle Epoque villa for sale in Cap d’Ail in South of France. With its refined beauty and rare luxury, it manages to find the perfect balance between a distinguished grace and a welcoming comfort. Enjoying a dreamy backdrop of the Mediterranean Sea, the prestigious property boasts some of the best views that Cap d’Ail has to offer. If you enjoy a carefree lifestyle yet still crave the finer things in life, the Residences at W Fort Lauderdale for sale seamlessly combines luxury vacation home ownership in Florida with hotel services and resort amenities. Sophisticated while maintaining a relaxed and casual vibe, the Residences at W Fort Lauderdale offer a stunning blend of a panoramic oceanfront setting, indulgent lifestyle and beautiful real estate. The property stands as a true personification of elegance and state-of-the-art living that is distinct from any other residential developments Florida. Barbados luxury real estate market remains one of the world’s most sought-after property markets, for good reason. With year-round sunshine, gorgeous sea and brilliant sand, direct flights, a wealth of chic restaurants and world-class golf courses, this tropical island has built a solid reputation as a luxury Caribbean real estate market. For expectations that go beyond exclusivity, to absolute singularity, our magnificent Barbados beachfront mansion for sale offers panoramic grandeur, immense beauty and a lavish lifestyle. This is a rare opportunity to own one of Barbados’ finest residential masterpieces. Readers will also find a contemporary beachfront property in Barbados for sale that is the embodiment of modern design perfection in a spectacular waterfront setting, an exceptional West Coast property for sale in Barbados that offers the ultimate in refined sophistication and infinite luxury, and splendour, affluence and prestige dominate these Barbados luxury villas for sale, and a limited-edition collection of some of Barbados’ finest luxury properties for sale, offering the pinnacle of beachfront elegance. With its immense natural beauty, incredible wildlife, pleasant climate, well-established infrastructure and excellent healthcare, luxury Costa Rica real estate continues to attract international lifestyle buyers and retirees. In this issue, THE ADDRESS Magazine features a stunning hand-picked selection of Costa Rica luxury homes for sale. A property of matchless elegance and beauty, our sensational home for sale in Santa Ana, Central Valley is the definition of extravagant luxury. Bearing all the impressive hallmarks of exemplary design, supreme detail and quiet glamour, it definitely makes a sophisticated statement. A stunning modern work of art, our exceptional private estate for sale in Costa Rica Pacific combines a jaw-dropping setting with a cutting-edge modern design. The views are indescribable – there is simply no way of characterising it. From the elegantly tasteful to the extravagantly indulgent, the ultra-luxury Villa Real Santa Ana property for sale is beyond compare. It is a true symbol of lavishness, prestige and grand scale, underscored by deluxe comfort. Stunning in its sleek design and unparalleled panoramic magnificence, don’t miss our modern property for sale in Dominical, Costa Rica that promises pure escapism and indulgence. Imposing splendour and quiet grandeur mark our commanding world-class Costa Rica mansion for sale that delivers a privileged lifestyle. There is no other place in the world quite like the French Riviera, with its wonderful climate, its stunning coastline, its geographical location, between sea and mountains, set only an hour and a half drive away from ski resorts and with its magnificent countryside. From Menton and Monaco to Saint-Tropez, the French Riviera embraces a combination of glamorous sophistication, natural beauty, elegant architecture and rich culture. Luxury French Riviera real estate continues to attract more and more property buyers, eager to settle here to enjoy the exceptional lifestyle it has to offer. THE ADDRESS Magazine showcases a great selection of fine properties for sale on the French Riviera including a panoramic luxury Eze property for sale that is an oasis of everlasting beauty and quiet elegance, a modern property for sale in Villefranche sur Mer that is hallmarked by contemporary design, functional layout, effortless luxury and aesthetic elegance, and a tastefully presented Belle Epoque apartment for sale in Roquebrune-Cap-Martin that is perfectly suited for sophisticated living. Boasting Spain’s most iconic cultural landmarks, a fabulous gastronomic scene and an exceptional standard of living, luxury Madrid real estate attracts a growing number of international house hunters looking to acquire a property as a second home, investment or permanent residence. This issue of THE ADDRESS Magazine showcases some luxury properties for sale in Madrid such as an exclusive home for sale in La Moraleja Madrid that dwells in an elegant refinement that at once embraces and impresses and a La Moraleja, Madrid luxury property for sale epitomised by classic grace and lavish beauty. There are numerous reasons to invest in Tuscany real estate for sale. From the stunning countryside, filled with world-class vineyards, to the elegant cities that house renowned treasures, as well as hidden gems, to explore. It is evident that the combination of coastline, mountains, countryside and beautiful towns and cities is hard to match. In this issue of THE ADDRESS Magazine readers will be impressed with a historic home for sale near Lucca where owners will surrender to an aura of refined grace and classic elegance, a historic property for sale near Siena with endless authentic beauty and Old World charm, a luxury villa for sale in Forte dei Marmi, Tuscany that truly amplifies a majestic seaside lifestyle, and a luxury estate in Chianti for sale with graceful architecture and spectacular far-reaching views is one of the most prestigious properties to buy in Tuscany. 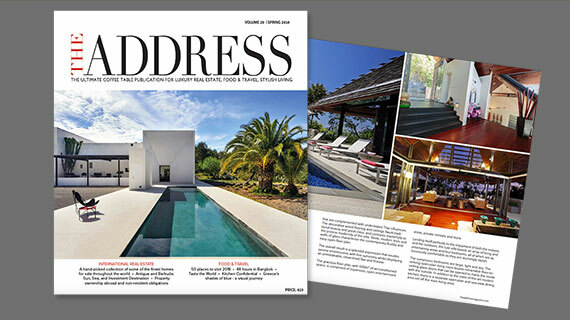 Also, in this issue of THE ADDRESS Magazine readers will find a timelessly exquisite property for sale in Carvoeiro, Algarve, an elegant Pedralbes house for sale in Barcelona that abounds in quiet sophistication, a new penthouse apartment for sale in Barcelona that is defined by stylish elegance and contemporary finesse, an elegant property for sale in Sant Andreu de Llavaneres Costa Maresme that is designed for effortless family living, a restored limonaia near Florence for sale that offers an unrivalled irresistible lifestyle where tranquillity and sublime luxury are complemented by a premium setting, a luxury Belle Epoque house for sale in Nice Mont Boron that is seductively beautiful, and a luxury property for sale at Surin Beach Phuket that exudes modern magnificence and immense style embraced by awe-inspiring views. Global citizenship is becoming an increasingly popular vehicle for the world’s wealthy, and this hot topic is addressed in the article “More Than a Sea-Change: Real Estate and Citizenship in the Caribbean”. One of the main reasons for a high-net-worth individual setting up base in the Caribbean is that several destinations have programmes to offer residency permits and citizenship through real estate investments. St Kitts & Nevis launched the first Citizenship by Investment Program several decades ago in response to an economic downturn and offered immediate citizenship to immigrant investors. With the success of the St Kitts & Nevis programme, several other Caribbean islands such as Dominica, and Grenada have subsequently launched their own Citizenship by Investment Programs. “Cyprus – An Island to Fall in Love With” focuses on some of the aspects that make the island a highly desirable place to reside and invest in. The Cyprus property market has historically being considered among the most robust property markets within Europe. It remains an attractive destination for the purchase of an overseas home, with foreign investors seeking to benefit from the favourable tax regime, the high standard of living and the sunny climate. The article also takes a look at programmes such as “Cyprus Residence-by-Investment Program” and Cyprus Citizenship-by-Investment Program, which further enhance the country’s attractiveness to foreign investors. If you are looking to find out one of the best areas in Florida to live, work and play in, this issue features an article about living in Fort Lauderdale. From its rich history to its attractive lifestyle that keeps all generations active and entertained, Fort Lauderdale has gradually become one of Florida’s most popular destinations and in turn one of the best places to live. The sunny coastal region of Algarve is one of the best places in the world to live or retire. In this issue we feature “Where to live in Algarve: Vilamoura”, which boasts a cosmopolitan atmosphere and world-class facilities. Those looking for a week or two of unsurpassed luxury, endless days stretched out on the golden sand in an atmosphere of stunning sophistication and impeccable comfort, you will find our luxury holiday home for rent in Saint-Tropez perfect. This stunning La Croix Valmer vacation home to rent in is beautifully crafted, distinctively designed and endlessly elegant. Tuscany is a perennial favourite, with the glories of Florence, Siena, Lucca and Pisa to enjoy. Renting a vacation home in Tuscany allows holidaymakers to fully embrace the Italian lifestyle. The classic beauty of our luxury holiday villa to rent in Lucca combined with its history, charm, and idyllic setting create the perfect backdrop for a Tuscan wedding, unforgettable holiday or exclusive rental. Spain is perhaps the most diverse country in the world, boasting snow-capped mountains, stunning beaches along the coast, historic towns, cosmopolitan cities, fantastic food and wine. It is home to a staggering 46 UNESCO World Heritage sites – third in number only to Italy and China- selected for their natural beauty, historic significance and cultural importance. From the magnificent work of Antoni Gaudi in Barcelona to the historic centre of Cordoba and the famous pilgrimage site of Santiago de Compostela — the choice of UNESCO World Heritage Sites to visit in Spain is impressive and varied. In this issue of THE ADDRESS Magazine, we have picked 28 of the most amazing UNESCO World Heritage sites to visit in Spain. Don’t miss our fascinating travel feature “Glorious Gansu – at the centre of it all”. Located in the northwest of China, Gansu formed the golden intersection on the Ancient Silk Road and is one of the birthplaces of the Chinese nation. Offering an entrancingly rich cultural and geographic diversity, it is not hard to lose yourself in the mesmerizing beauty of the Gansu. Its varied landscapes include parts of the Gobi Desert, the Yellow River, numerous mountain formations, and remnants of the Silk Road and the Great Wall of China. Our article “Kennett Square and the Brandywine Valley: Pennsylvania’s Hidden Treasures” let you discover historical estates and a fabulous food culture. This hotspot just an hour south of Philadelphia is well-known by locals but off the radar of most travellers. Having said that, the region’s growing status as a gourmet destination should warrant closer inspection. Our article “Taste the World – Epicurean Travel” features six of the best immersive dining experiences in the world, from Lima to Lisbon to Vienna. Here the food is sensational, underpinned by well-sourced ingredients, refined flavours and expert technique. Every year certain trends appear that help shape the culinary landscape. In the article “Food Trends 2018” 10 leading Chefs predict what we will see next year in terms of dishes, flavours, ingredients and techniques. Each issue of THE ADDRESS Magazine features profiles and interviews with a leading chef, plus a few of their signature recipes. In this issue, Mark Edwards, Executive Head Chef at Nobu London and Berkeley ST talks to THE ADDRESS Magazine about his culinary philosophy, the most used cookbook, his favourite comfort food and much more. Mark Edwards also shares his sublime Seafood Ceviche Nobu Style recipe, his fabulous Dover Sole with Spicy Shiso Dressing recipe as well as his irresistible Crispy Gloucester Old Spot Pork Belly with Spicy Miso recipe. Curated is a section of the magazine dedicated to recent discoveries for stylish living, kitchen & dining, travel, well-being and beauty. Finally, explore our photo essay “New York – A Visual Journey through Autumn’s Dazzling Colours”. With much of New York’s fall foliage bursting with colour, there is no shortage of places to view the city’s autumn splendour. A visual feast, where vibrant reds, striking golds and fiery oranges are aplenty throughout the city. Click the link to enjoy Volume 28 of THE ADDRESS Magazine, celebrating luxury homes for sale around the world along with inspirational food and travel articles.